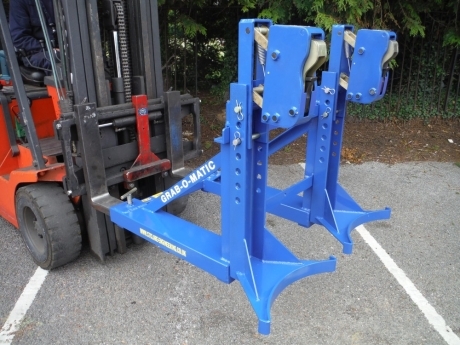 The Grab-O-Matic 2-DLR Double Drum Handler is suitable for all steel open top and tight head drums, plastic ‘L’ ring drums and most fibre board drums and is attached to the forks with zinc plated ‘T’ bolts. The 2-DLR is fitted with 2 x Grab-O-Matic HD-1 gripping heads that grab the drums securely on the top rim, a mixture of steel and plastic drums can be grabbed at the same time or just a single drum. 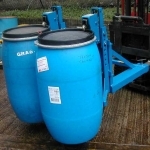 Damaged drums and drums of various sizes and diameters can be safely and efficiently grabbed with the 2-DLR. 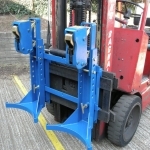 Double drum handler that fits directly to the carriage of the fork truck. 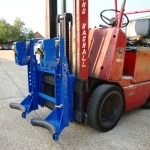 Double drum handler heel fitting with the rubber fender drum protection. 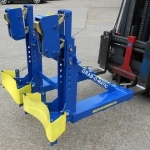 Quick attach release double drum handler fork attachment. 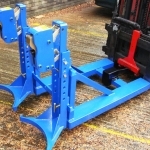 Standard rim grip double drum handler fork attachment with webbing drum supports. 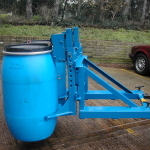 Suitable for all steel open top and tight head drums and plastic L-ring drums. 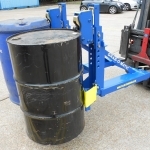 Double drum handler suitable for all open top plastic / Mauser drums.